Listening to this album makes me sad. John Reis’ career is not one that’s always appreciated. I would know, because I’ve come to it late in the game, and it’s one I’m still trying to absorb and get comfortable with. The name Drive Like Jehu gets dropped a lot in musical circles, but honestly, I don’t see what the big deal is. I’ll blame it on the fact that I’m a philistine and can’t recognize good music when I hear it. Fine. Until I hear Yank Crimes with fresh ears and see the light, I’m comfortable lumping that band into the “homework” category. Personally, I like Reis’ later work a lot more, and for that I have the Obits to thank. Like with anything the man does, it has that familiar yet completely distinct sound. Reis’ albums have his personal touch all over them, and that is very much a good thing. I am into all his newer projects, but unfortunately never get a chance to revisit them once they’re out of my rotation. Also, my memory isn’t what it used to be. 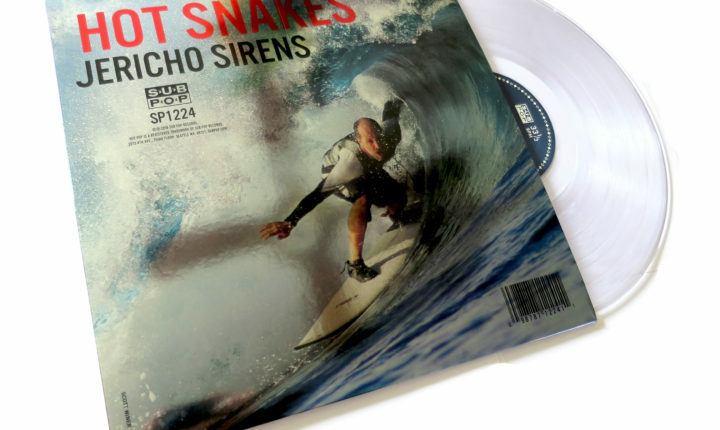 The Hot Snakes haven’t put out an album in 13 years and this newest effort Jericho Sirens is as good an example as any of how important they are to the current music scene. Hearing the opening track I Need A Doctor is the perfect reminder of an old, strange friend. It also sets the tone perfectly for what listeners are in for. Jericho Sirens sounds crisp, furious and apocalyptic but also doesn’t take itself too seriously. It’s also chock full of the juiciest riffs you’ve ever heard. It’s pounding yet also stubbornly sure of its rhythm. Reis’ screeching vocals are not for everyone, but they’re definitely my cup of tea. The vinyl package bears mentioning as well: with a glossy and shiny cover (that’s hard to photograph), printed sleeve, and clear vinyl which is the standard for this release (told you this band had a sense of humor), it’s as cool as the album itself. I wish more bands sounded like the Hot Snakes. I wish more albums sounded like Jericho Sirens. It’s another brilliant effort from a unique sound that’s as fearless as ever. Get it straight from Sub Pop.